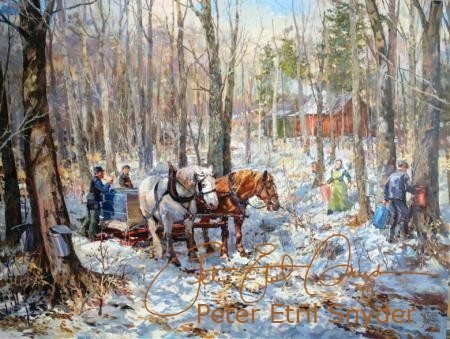 This shows a traditional maple sap gathering scene. A team of horses pulls the sleigh on one of the routes between trees which are hung with sap pails. A child rides along on this exciting activity. In the background the sugar shanty is already showing billows of steam as the man inside stokes the evaporator. This painting was commissioned by the Elmira Maple Syrup Festival to celebrate their 50th anniversary. I tried to include many aspects of the traditional gathering experience as this piece will continue to be used for their poster. This is still a familiar sight in Mennonite country. A farmer with his team and wagon accompanied by his dog roll along a rural road. In the background a Mennonite farmhouse altered by each generation to suit its needs provides a colourful backdrop. This is an ideal scene with a small stream through the pasture providing water for the Holstein cows. This painting was started as a performance piece at Paintertainment, a fundraiser for Drayton Entertainment, at the St. Jacobs Schoolhouse Theatre. In the weeks after the performance I sent updated versions to Drayton Entertainment who in turn passed them on to the people who had attended the show. The painting was won at the event by a woman from Cambridge as the door prize. 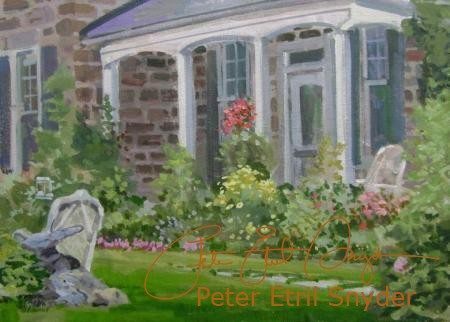 Painted partially on the site of this historic farmhouse near Ayr, at a fundraiser for ALS, this painting was a great deal of fun. Over the years I have done many paintings in the public and find that each time I do, I wonder why I don’t do it more frequently. A request by the Shantz committee, preparing to celebrate the 200th Anniversary of their family’s arrival in what has become Waterloo Region, sparked this re-creation. This original farm, located in the east of Kitchener, was founded by Christian R. Shantz. 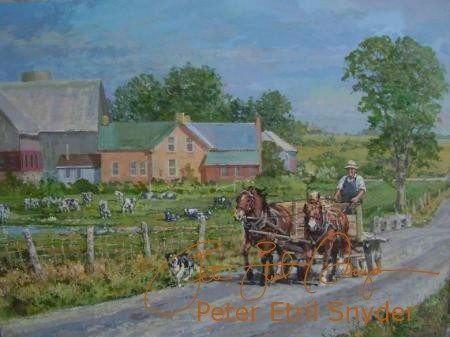 Successive members of his family added buildings and refinements to make the mature farm shown in my painting. I have a special interest in this historic view as I am also a member of the Shantz clan. Reproductions of this painting were used by the committee to defer some of the costs of their reunion. After viewing photos provided by the Galt Country Club and then walking the course, I put together a number of small acrylic sketches of several areas that I thought most attractive. The committee was unanimous in their choice of selecting Hole #14. 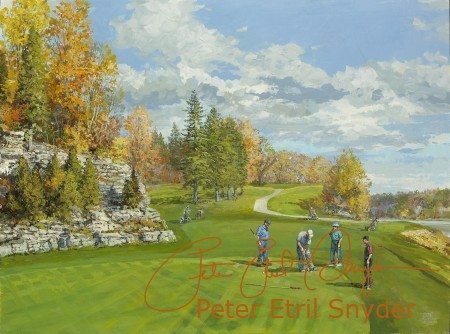 This unusual situation features a high rock wall that is most distinctive and tells the viewer of the painting on first glance that this is the Galt Country Club Golf Course. I suppose that one could call this the signature hole. 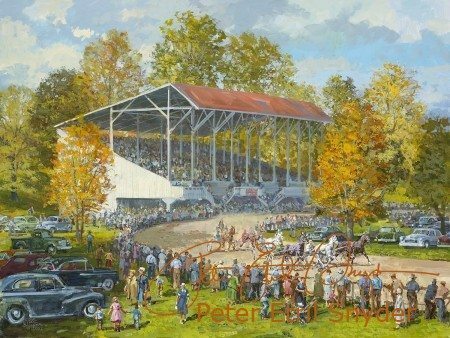 The terrible tragedy of the burning down of the old grandstand at New Hamburg directed my attention to this symbol of the Canadian Pacing Derby. During the 1940s and 1950s, this venue drew crowds from across the northeast of North America. In this painting, I re-create that time and I hope some of the excitement. In this unusual situation I commissioned myself to put together this piece from my childhood. 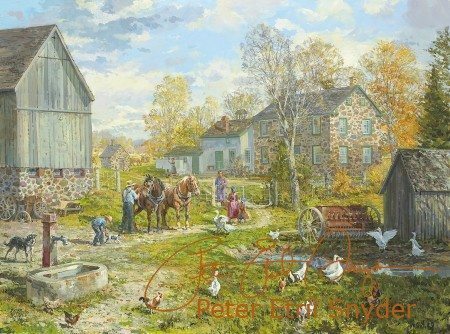 Reproductions of this painting were later used to raise funds for Wilmot Township. The original was purchased by a civic-minded couple who donated the painting to the Township. Using impressions of Scotland and a few of its distilleries, I created a montage that I hope says Scotch. I have deliberately avoided particular producers because I wish to present the industry, not individuals. 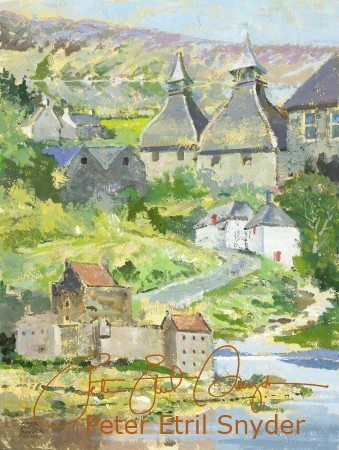 This painting was created for a single malt whiskey tasting fundraiser event that we held at our gallery in the spring of 2008. Using photographs of various Scottish distilleries along with a few bits of Scottish scenery including Eilean Donan Castle, I composed this montage entitled Scotch. The beneficiary of this event was Catholic Family Counseling Centre in Kitchener. 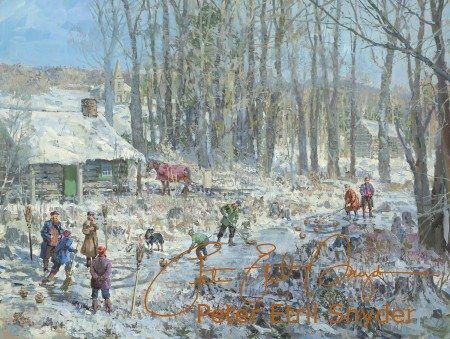 Based on the records of the Fergus Curling Club, this painting shows a scene from 1834 when men gathered outside Blacks Tavern to curl on the street. Although there seems to be some controversy about the claim by Fergus to be the oldest continuously operating curling club in Ontario, there can be no question of the dramatic and romantic appeal of the idea that drew me to paint this historic re-creation. I have had massive support from The Wellington County Museum in searching out the facts as well as the help of the members of the Fergus Curling Club allowing me access to their records. CLUB FUNDRAISER — YOU CAN PURCHASE THIS, OR ANY OF 600 OTHER LIMITED EDITION REPRODUCTIONS, DIRECTLY FROM THIS WEBSITE, WITH A COMMISSION BEING REMITTED TO YOUR CLUB. 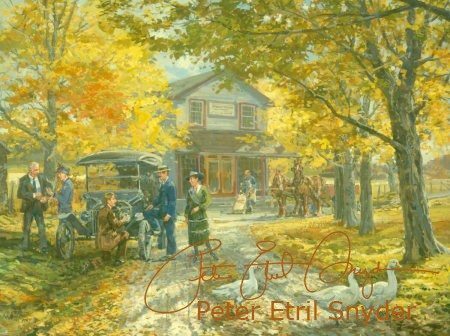 This painting is an authentic recreation of 1921 using a village store building at Doon Heritage Crossroads, a grocer and his dolly-cart from Linwood, and a couple of text books of historic clothing styles to compose the time warp. The year, 1921, was chosen to be depicted because of its significance in the treatment of diabetesin that year insulin was discovered. This painting was donated to the Juvenile Diabetes Foundation for sale or auction. 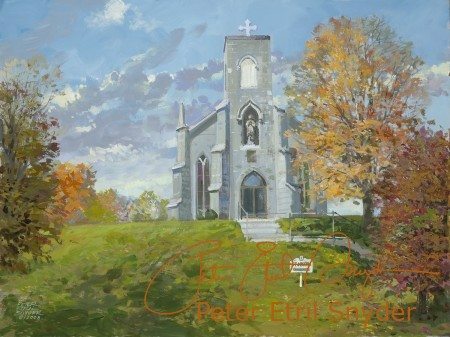 Commissioned by the longtime organist, this piece shows the unique setting of a church which has stood on the hill overlooking Fergus for over 100 years. A dramatic strike of lightning in the early part of the twentieth century damaged the elegant tall steeple, so a decision was made to take off the remains at the base which has left this stone building with an unusual, easily identifiable face. This congregation has now decided to build a new church due to structural problems in this much loved older building. Reproductions of my painting are raising funds towards the purchase of a new organ for the new church.